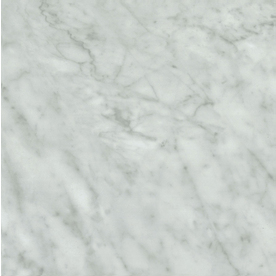 In our last post, we discussed how to get old tiles up before laying new tiles. 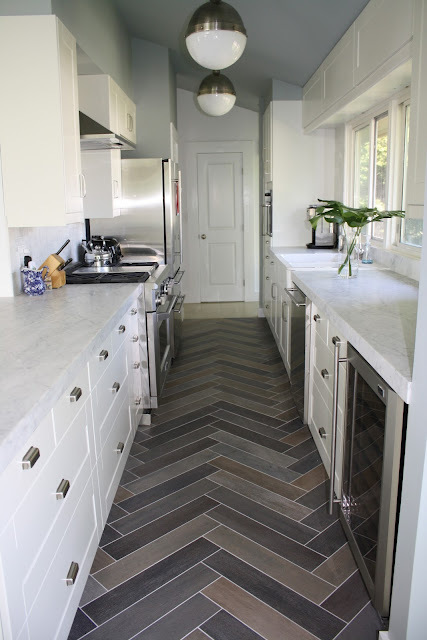 Today, we’ll talk about the incredibly scientific process we used to lay the new basketweave patterned vct tiles that we decided upon for kitchen. 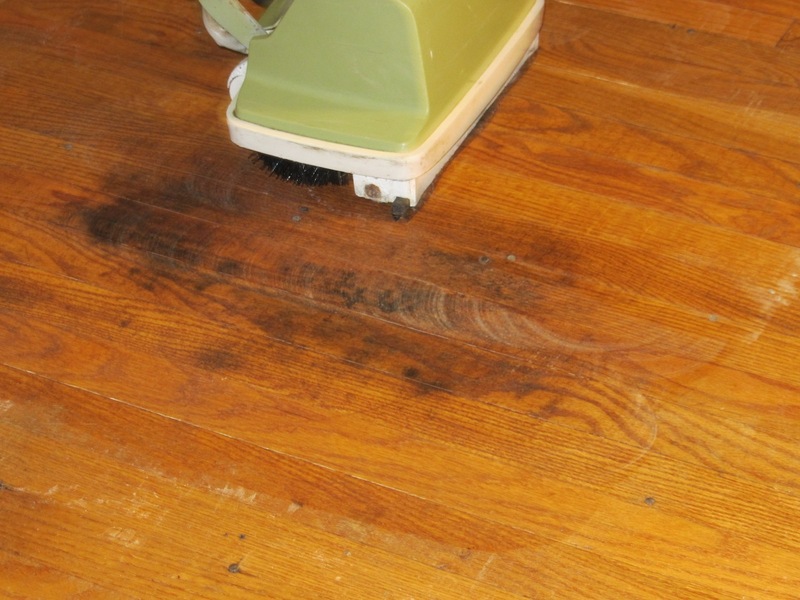 Once your floor has dried from the soap and water bath, you are ready to move to the next step. Leveling. 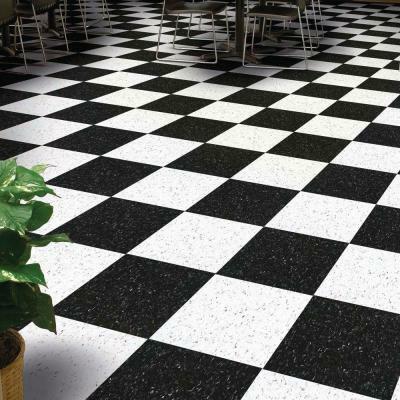 With VCT tile, we read that any variation in the floor may lead to the tile cracking or shifting, so its very important to start with a nice flat surface. 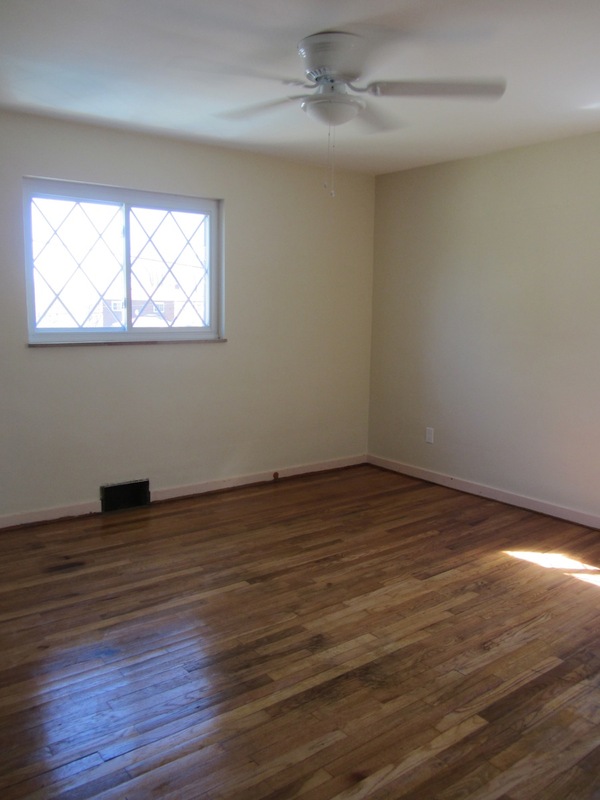 What this amounts to is that basically you fill in any nail holes, cracks between subfloor boards, etc. 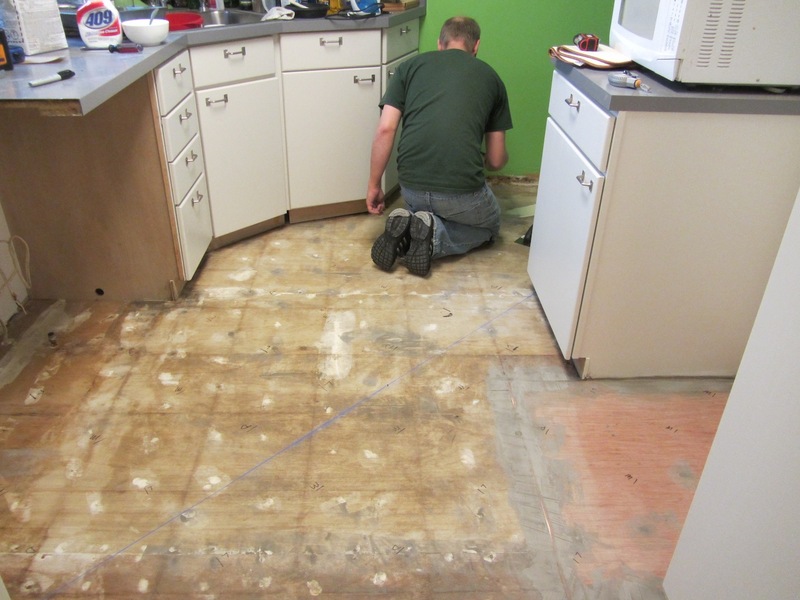 Once we removed our old tile, we were greeted by a huge rotted space of subfloor where the refrigerator sits. 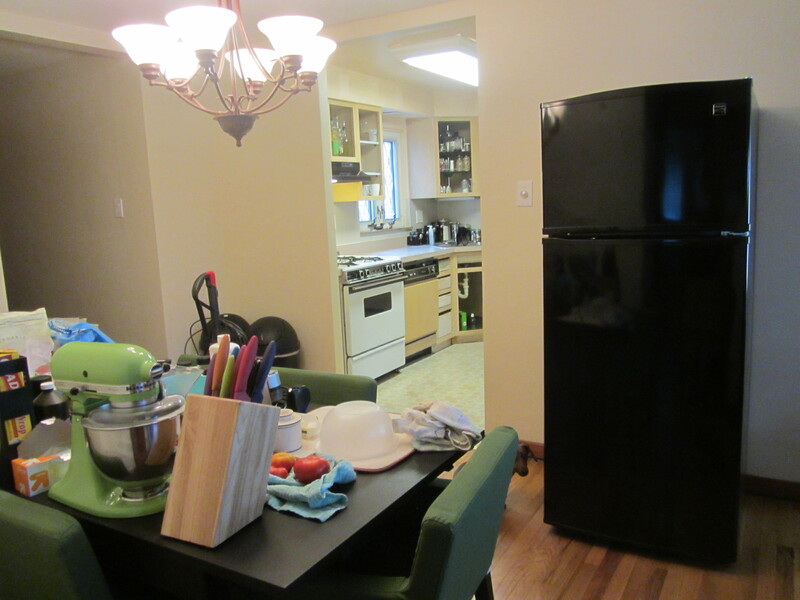 When we first moved in, there was a gigantic fridge that leaked and smelled & we got rid it of within our first week. We figure that was the likely culprit of the damage. 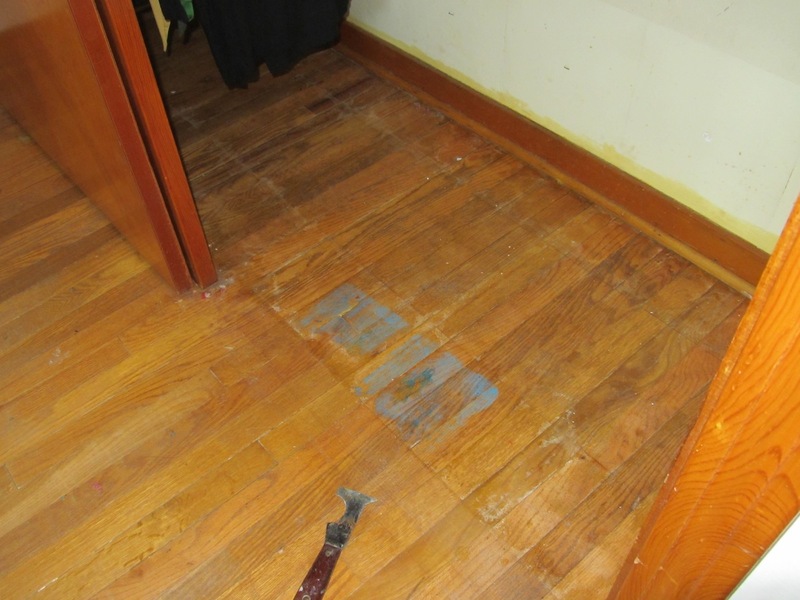 Instead of replacing all of the subfloor, Kevin took out his circular saw, set it for a very limited depth cut and cut as straight as possible around the damaged area. He then just cut a fresh piece of luan and fit it down into the hole. Then everything was ready to be leveled. As far as leveling goes, we used Ardex Feather Finish cement compound. We mixed up a very small amount to where it was slightly thicker than recommended and filled in all of the holes, divets, ridges, cracks, etc. 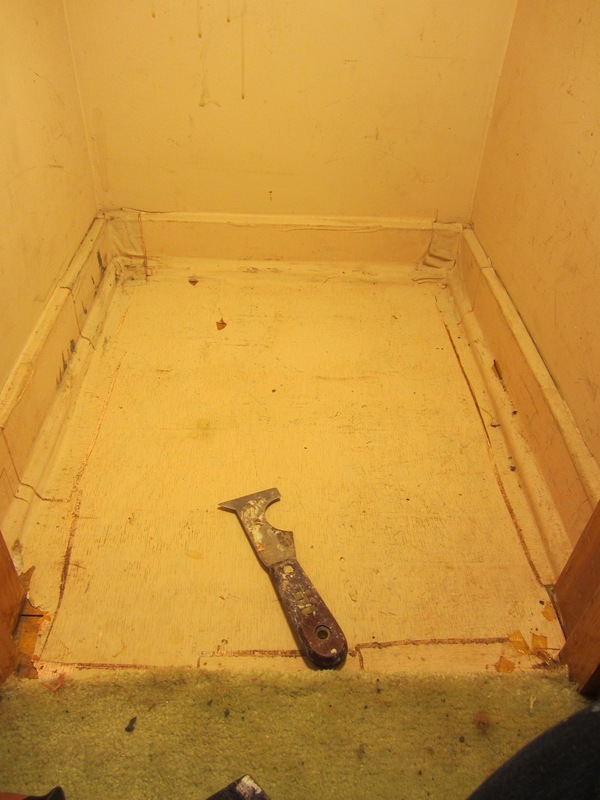 For example, between the fresh luan and the old subfloor, there was a small gap. I filled the entire gap in with feather finish and then feathered it out so there wasn’t a noticeable ridge. It then just had a small very low-grade ridge. For good measure, we covered all of the old nails and any place where the subfloor had any sort of texture with the feather finish. This whole process took maybe all of 15 minutes and was well worth it. Once the feather finish dried completely, we laid out a chalk line as our “starting line.” I decided where I wanted our basketweave “to intersect” in relation to the door and then Kevin did whatever magical math he needed to do to decide how that meant the tile needed to be laid. We wanted to lay them at an angle, so we placed our chalk line the longest diagonal point our kitchen had. 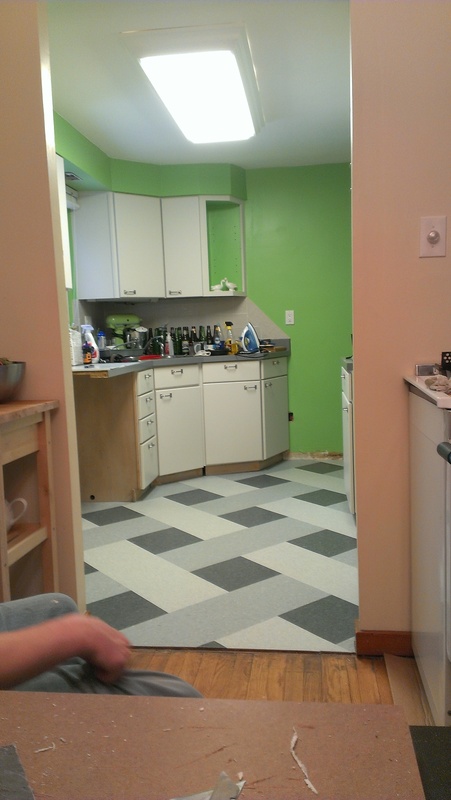 Once that chalk line was down, we laid out our tile pattern along it and covered the entire kitchen floor. (NO ADHESIVE AT THIS POINT). Our reasoning for laying out the pattern without adhesive one last time was to ensure we didn’t make any mistakes. Once we had the pattern completely laid out and we were happy with it, we’d pick up one tile at a time and where that tile was Kevin would mark out which tile would go there. It should be noted that the pattern in VCT, while subtle, is definitely directional. The small dots of the pattern move from one side of the tile to the other and it is very noticeable (to me) if from one tile to the next, the pattern switches directions. As a result, he also put an arrow on the floor, denoting which direction the pattern would go. We used “D,” “M,” and “L” to denote dark, medium, and light, respectively. This is a crucial step to the process. Otherwise, you are left to not screw up the pattern once the adhesive is down. Next it’s time to trowel out your tile adhesive. Your local home improvement store will sell VCT tile adhesive. Be sure that before you walk out of the store with your chosen adhesive, that you read the back of the bucket. The back of the adhesive will also tell you what size trowel to buy. Troweling on the adhesive is just what it sounds like. Put your trowel in the adhesive and scoop some out on the floor, then spread it out. If you’ve ever laid any sort of towel before (say, ceramic tile for a backsplash or bathroom), its generally the same thing. Here’s a picture after our floor was covered in adhesive. 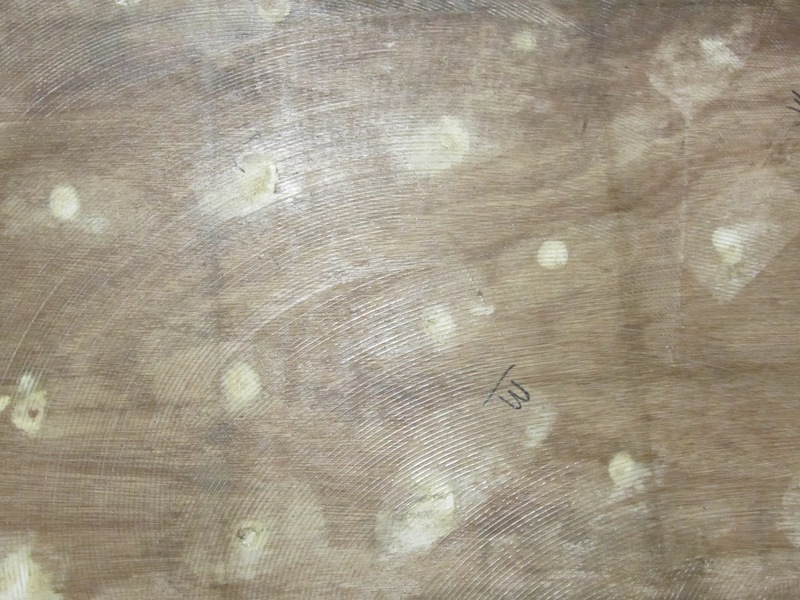 In the pic, you can see the trowel marks of the spread adhesive, and also the marked out floor pattern. 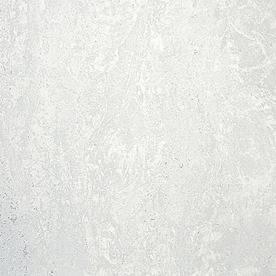 The tile adhesive has a really long dry time, giving you plenty of time to lay your tiles correctly. So don’t rush. Carefully lay each tile, butting it up to the next tile and then pressing down hard on to the floor so it doesn’t shift. Once you put it in the tile, you “can” pull it back up and adjust it, but more than likely it’s going to snap if you pressed it into the adhesive. So do it right the first time! 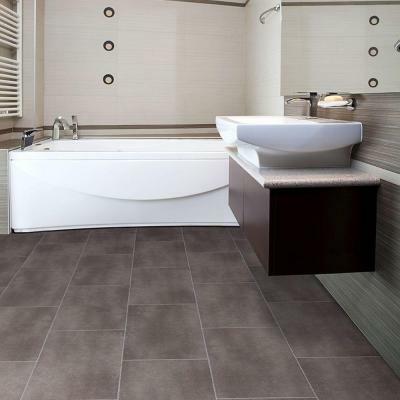 Lay every tile carefully so as to avoid having to adjust it. We started our pattern by just laying the first line of tiles along our chalk line. Kevin went straight down that line, laying the first tiles, then standing on them to lay the next, until he had a straight line across the kitchen. Then, he backtracked and laid down the next row to the side. Eventually, he broke this straight line pattern and just laid full chunks at a time. Laying the full tiles (ones that did not have to be cut) went down really quickly. We had nice system going on. We started with Kevin going around the house to the outside door and starting the floor from that end, working towards the entryway from the dining room. He took about 10 of each color tile with him. As he ran out of tiles. I stood in the doorway of the kitchen and handed them to him – usually one at a time, sometimes a chunk of one color at a time. Whatever he needed or preferred. The main bulk of the floor (again, the ones that didn’t need to be cut), went down in about 20 minutes tops. We were starting to think this was going to be an hour project and done. We were grossly wrong. It turns out, cutting tiles is time consuming. The best advice I can give you on that is to start with the easy cuts first and again pay attention to the pattern. A few times Kevin cut a tile and then realized he cut it with the pattern going the wrong way. As for how he cut the tile, he consulted a youtube video. This one to be exact. I’ll let explaining how to cut be done by somebody who actually understands it. As I do not. We didn’t buy the tile cutting tool, mainly to keep costs down. If we had to do it over again, we may have, but I believe it was somewhere between $30-50 at Home Depot. So keep that in mind when decided whether or not you just want to use the razor blade and snap method that we employed. I will say it seemed to work just fine, but it may have been more time consuming than the tool. No way for me to really know about that now. After you get all of your tiles laid and your floor is completely covered, I’d highly recommend using a floor roller over top of them. We rented one from home depot for 24 hours and had plenty of time to spare. Its basically just a giant weighted roller on a stick and you push it around in all directions. It’s actually kind of fun. You can hear the air bubbles in the adhesive beneath the tiles popping. Kind of like a giant bubble wrap. Don’t run over your toe. Now stand back and admire your work. Your/our new floor is beautiful. If you are anything like me, you’re obsessed with it. I am completely obsessed with it. I think it makes the kitchen look so much bigger. I’ll post more pictures of it soon. Truth be told, I chose this picture because all of the pics of it from right when we were done that show the whole kitchen also show Kevin’s extensive empty beer bottle collection. For Homebrewing. But it makes us look like huge drunks. Yikes. Today we will talk about the steps we used to remove the old, cracked, filthy tiles in our kitchen. It’s a lot of work, time wise, but not really muscle-wise. I shouldn’t really comment on that since I had minimal involvement with it, but I will say that all that bending over really does a number on your back. So take that in mind. However, as far as DIY goes, it’s simple and you probably have the skills needed to pull it off. Say bye bye to that old floor. Place the iron on top of the tile to be removed. Keep the iron moving. 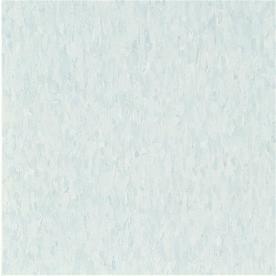 The heat from the iron (or heat gun or hair dryer) liquifies the adhesive and the tile will come loose. 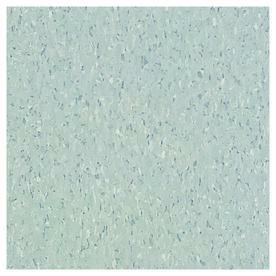 Put your putty knife/scraper under the edge of the tile and separate the tile from the floor. If it doesn’t come up easily, put the iron over it for a little longer. Just keep rotating between ironing the tile and scraping underneath the tile until you’ve easily removed it. After the first couple tiles, you’ll find your sweet spot. Once you’ve got a few tiles up (Kevin removed about six 12 inch tiles at a time), put on your gloves & cover your freshly uncovered subfloor in the adhesive remover. Be generous. This stuff looks like almost-clear snot. We put on a nice 1/4 to 1/2 inch thick layer of it. Cover your adhesive remover smeared section with the plastic sheeting. You do this to seal out the air while giving the adhesive remover some time to work. After your time has passed, pull up the plastic & discard. Then, using your putty knife/scraper, scrape up the adhesive remover (and, accordingly, the adhesive). With fresh soap (we used dawn dish washing liquid) and water, use your scrub brush to scrub the floor. I wouldn’t even go so far as to say “scrub vigorously” – just scrub it up. This gets the remaining adhesive off and cleans the floor up nice. It should be noted that the ironing/heating element is not really necessary. 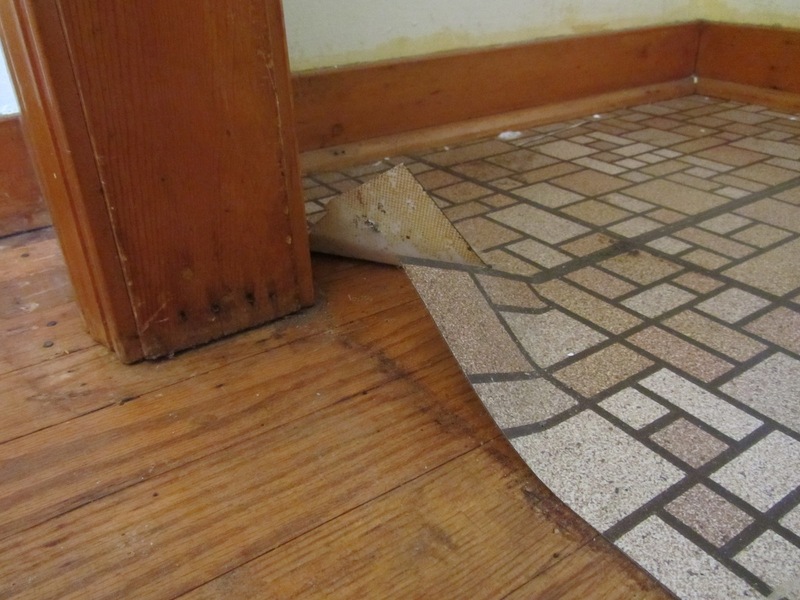 You can just scrape up the old tiles, but then you risk damaging your subfloor. 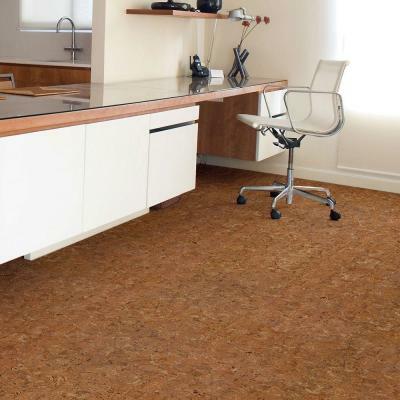 We wanted to keep and reuse our subfloor, but if this is not an issue for you (you already plan to replace the subfloor), then you can just scrape away. Simple! Voila! Do you have any tips/questions/etc? 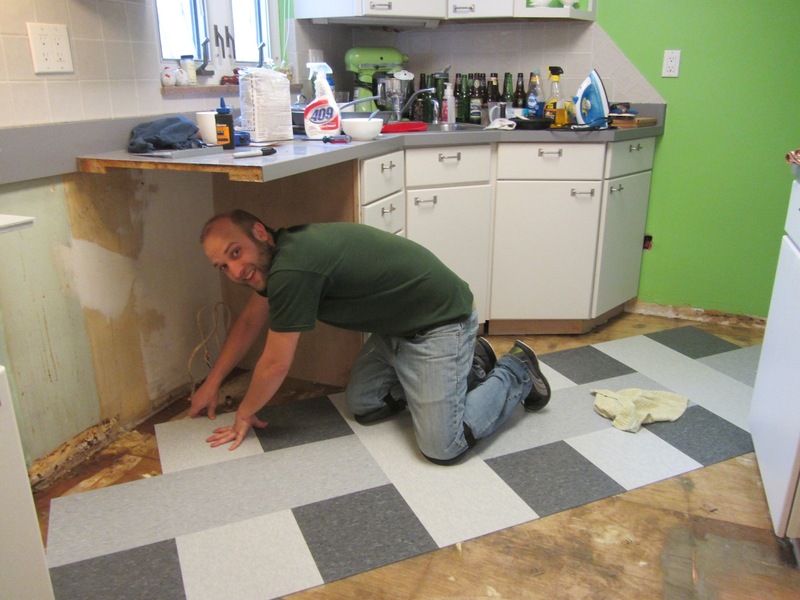 Stay tuned for our tips on leveling the floor, installing the floor, and the big reveal! 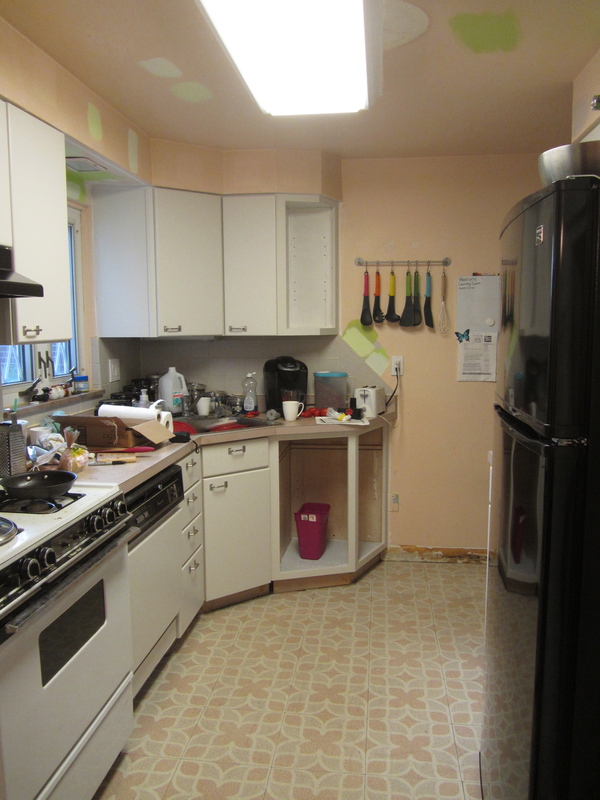 As mentioned yesterday, it’s been a huge long while since I’ve updated this blog (sorry again), so I am way out of practice on my home reno related puns. Let’s pretend this post is titled funny. 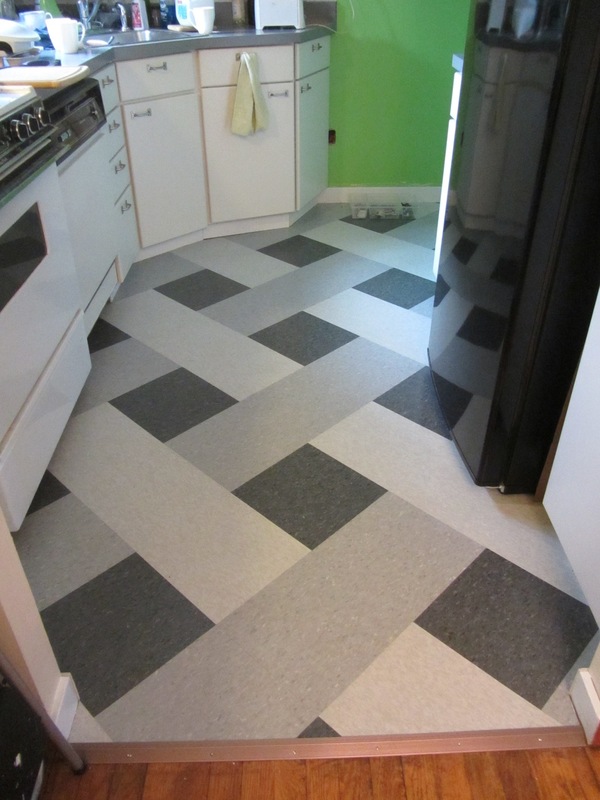 When we last addressed the kitchen floor (here) way back in September, I mentioned that our plan included the keyword of “cheap” – and I’d say we nailed it. 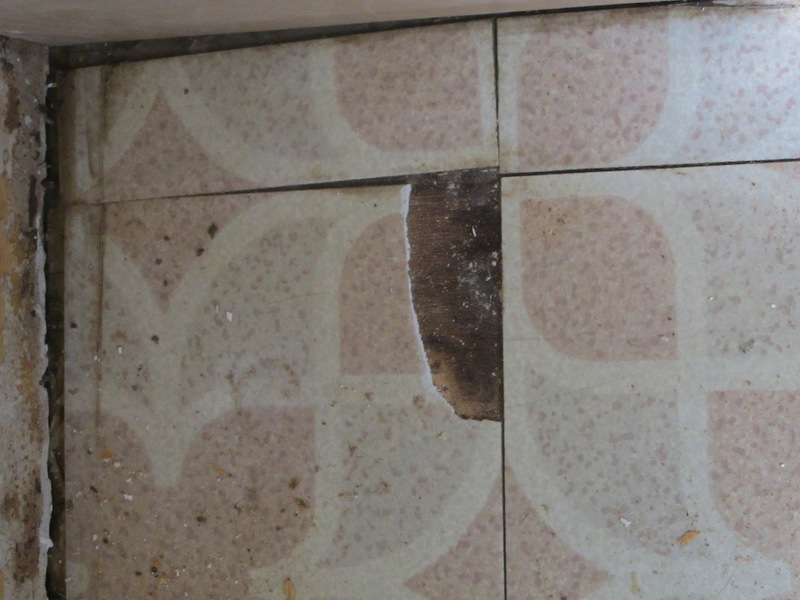 Who doesn’t love pink, filthy, chipping linoleum tile from however many decades ago? 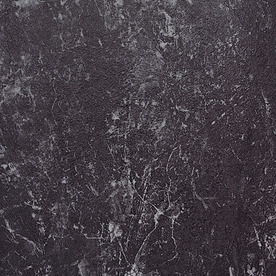 So in that post way back in September, I listed out about a dozen different ideas we had running through our minds, but we eventually settled on vct tile. 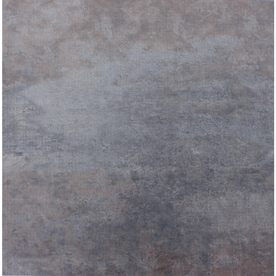 We had our reasons, but the real reason we just went for it was my stumbling upon this post at design*sponge that just had the most fabulous cheap floor ever. I was immediately obsessed. 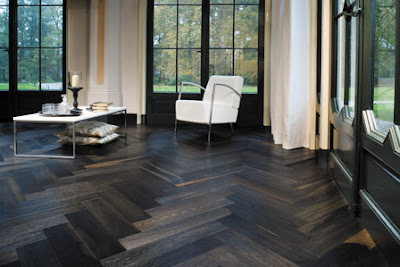 To me, it was just the perfect floor with huge visual impact and in our price range (Under $1.50/sq.ft). So I started to research VCT Tiles and what I found out sealed the deal. As it turns out, they were way under budget (Around 75cents/sq.ft). Also, they came in a huge rainbow of colors and I could customize to exactly what I wanted. 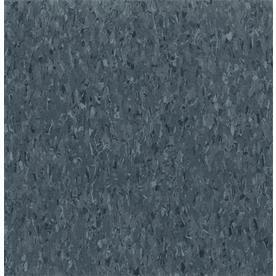 Originally, my heart/head said I wanted grey (to match the cabinets and backsplash), white (the neutral), and a pretty blue (because, thats just where my head went). 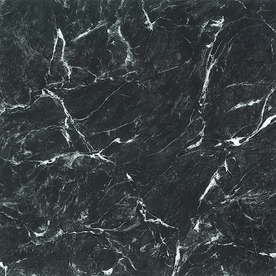 I went to Home Depot and on about 10 different occasions asked somebody in the flooring department to help me with VCT tile ordering & nobody ever knew what I was talking about to help me. I would literally be standing in front of the big poster they have at home depot telling you to “custom order VCT tile” and the worker would tell me that wasn’t possible. So I gave up on that and went home to order it online. However, Home Depot’s website was even less helpful than their store workers. As a result, for this project, I switched teams and ordered from Lowes.com. If you search VCT on Lowes.com, you’ll come with about 300 (I don’t even think thats over-exaggerating) results. Be cautious, some of them are ridiculously priced (I still haven’t figured out why, but I didn’t really look into it- I just didn’t order any of those ones). I ended up ordering about 14 different colors – a few each of blue, grey, and white – because I couldn’t decide based on what my monitor was showing what would look right in the kitchen. And it’s a good thing, too, because the ones I would’ve swore were perfect ended up being horribly horribly wrong. The whole bill ended up being north of $450. I called Lowes and double checked that whatever tiles I decided I didn’t want, I could return & was triple-ensured that was the case. About a month later, we got the call that our tile order was waiting for us at Lowes. We headed down and loaded up our haul. I never considered how heavy these tiles could be. I actually didn’t think they would be heavy. I was wrong. I couldn’t lift a single box. I won’t even try to wager how much they weighed, but our small Corolla was quite the low rider. 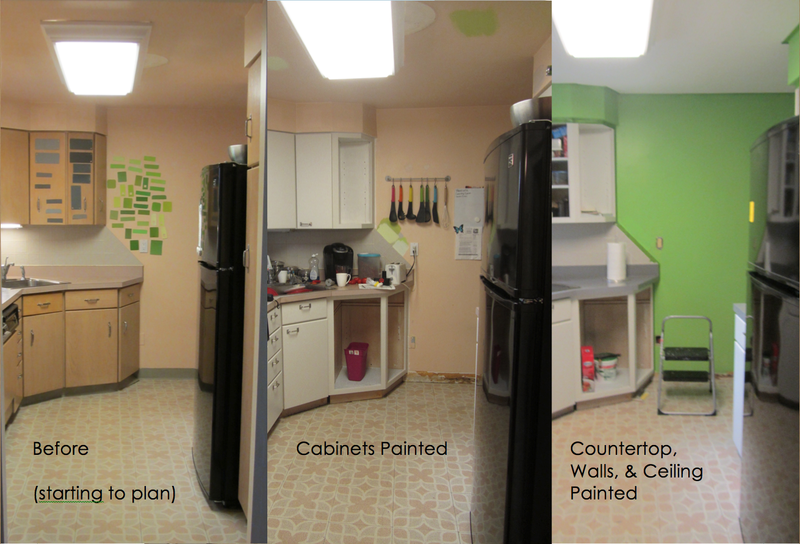 When we got them home, we quickly realized that the colors I had previously had my heart set on were wrong. But first, we tried out a ton of different patterns to make sure it wasn’t the pattern’s fault it looked awful. Spoiler alert: it was my color choice. Here are some of the patterns we ran through, just in case you’ve stumbled upon this entry in hopes of finding VCT floor patterns. Eventually I realized it was the colors that were all wrong and switched them out to be something much more subtle and classy. More on that, soon! The view is almost identical.. except the camera is held in a different orientation (sorry, I am learning to fix my before&after photo taking quirks as we go). I’d say its mucho improved. 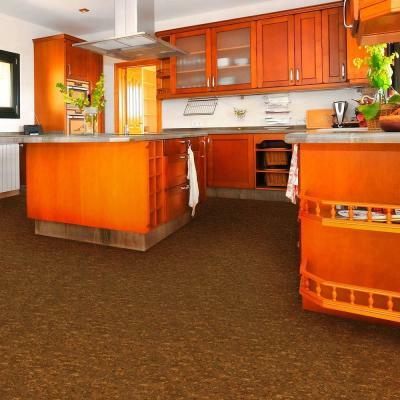 I don’t know why anybody would look at this and prefer carpet. haha Of course, it didn’t come without its quirks. More on that later! Naturally, we plan on painting all of the trim a nice crisp white. 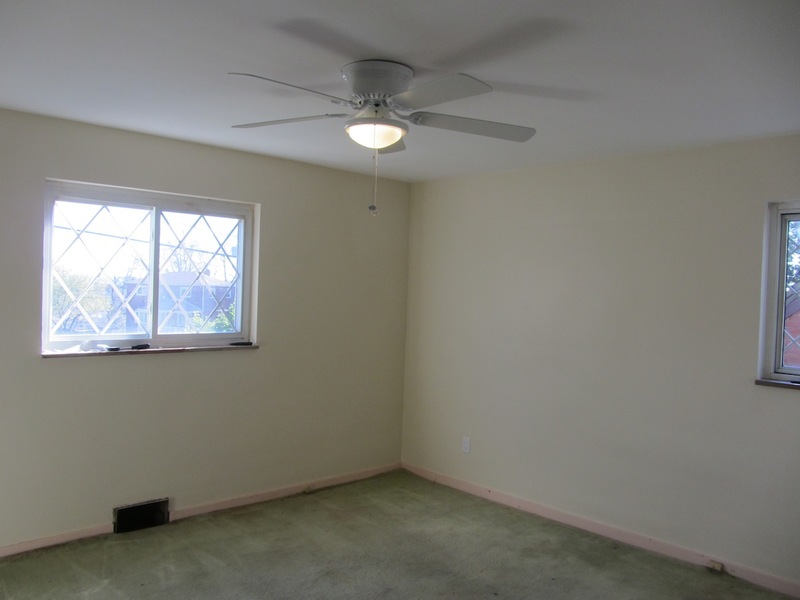 This room makes it especially necessary since whoever lived here before decided not only should the room be flesh pink, but the top half of the trim (visible above the carpet) should also be flesh pink. I shake my head at this. What are your thoughts on our before and after? We’d love to hear some feedback! 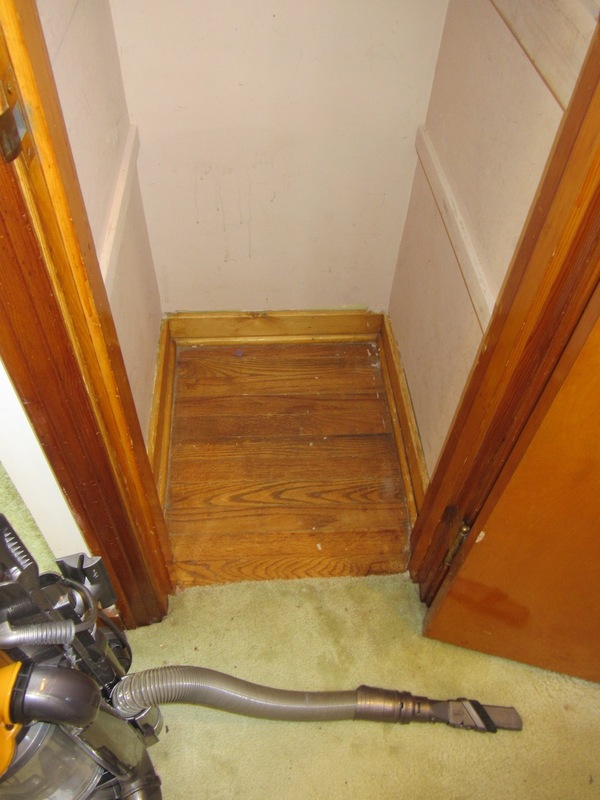 Under the carpet in every room in the house was just piles and piles of dirt. 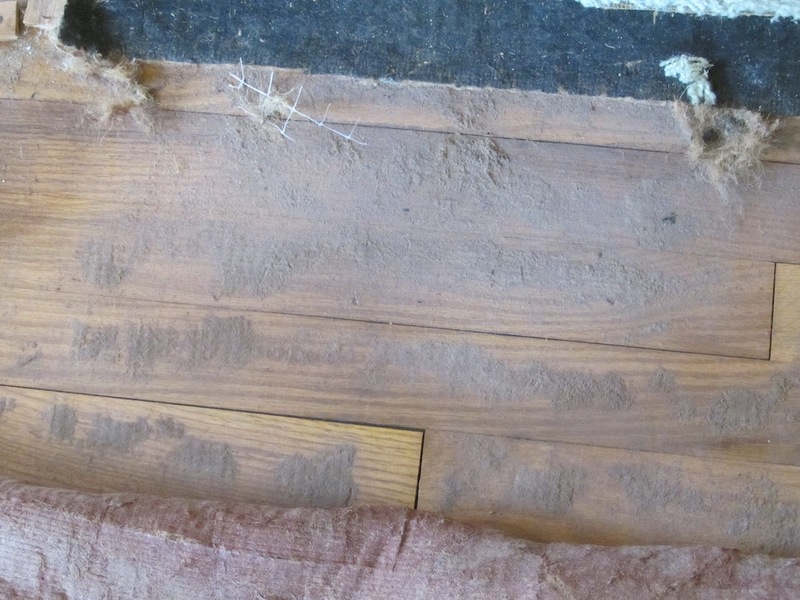 This made me really appreciate hardwood floors and (must easier to wash/maintain/replace) area rugs. Hello hardwood! 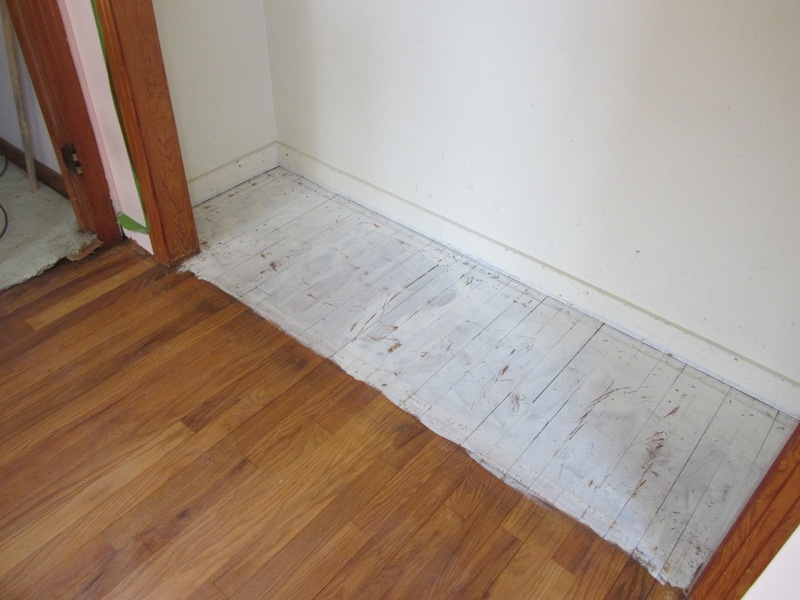 Stay tuned for a post on how we removed the carpet, then exposed & cleaned the hardwood!